This article is a continuation of what I have posted last week. Having dealt with the history and rigors of gymnastics, I'll then continue off with the different kinds of gymnastics which are acrobatic, aerobic, rythmic and trampoline and tumbling gymnastics. This type is one of the oldest sports that people have been engaging themselves into for it has been performed as early as 2100 BC. The term acrobatics is from the Greek word acrobateo, meaning 'to rise' or 'to go forth'. The sport necessitates its athletes to have courage, strengtgh, stamina and flexibility as the routine is performed with music. Body control is the key for most positions, whether on the ground or in the air. This type of gymnastics mudy be performed through continuous, complex and high-intesnity movement patterns to music. Aerobic dance itself improves cardiovascular endutance and fitness levels. Different aerobic movements comprise of the dance to involve different muscle groups and increase the heart rate. For competition purposes, the difficulty of each movement is also judged. Athletes must always maintain their body alignment no matter what position they may be doing. This is considered to be both an art and a sport as it incorporates dance and gymnastics. Unlike the two abovementioned types, rythmic gymnastics can only be performed by women due to the kind of flexibility it requires out of them. It is performed to music with the common props such as rope, hoop, ribbon or clubs. An athlete must combine her natural talent together with hard training to be able to develop strength, flexibility, jumping abilities, spatial orientation, stamina and handling skills of props. The two gymnastics sports can be grouped together as they have many things in common. 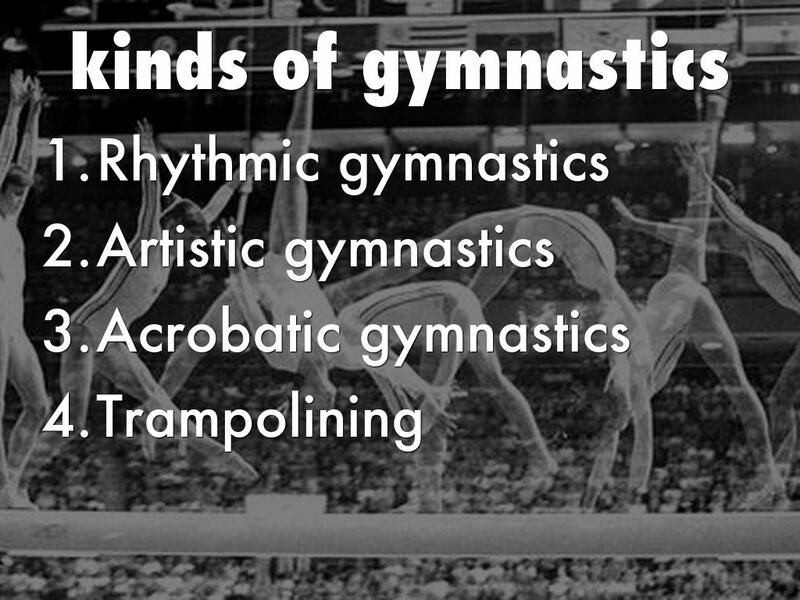 Trampoline gymnastics is an elite sport, associated with its boldness, elegance and precision. During a performance, athletes must be able to showcase to the audience courage, elegance, agility, magic and youthfulness. Tumbling is continuous, speedy, complex and rythmic. Athletes do it from hand to feet, feet to hands and feet to feet for only six seconds in a 25-meter dynamic track. Athletes must possess a perfect combination of speed, rythm, somersaulting and twisiting movements for virtuousity and controlled energy. Personally, since I'm already into fitness, I prefer and practice aerobic gymnastics. My mentor is Marc Dungo, the guy in the middle of the picture I posted for Aerobic Gymnastics. This is a shot from my practicing room at home with my costume on for a practical exam I had then in P.E.